The human body is made up of billions of cells. Cells are the tiny building blocks of our tissues and organs. We all started life as a single cell. That cell made an internal copy of itself (replication) and then divided into 2 cells. Those 2 cells then also replicated and divided, so the two cells became four cells. The four cells replicated as well and divided into eight cells, and so on. Cells specialize to perform particular tasks. Some cells will cluster together to form a finger, for example. Others create skin and heal the skin when it is wounded. Cells get old and die after a certain amount of time (“programmed cell death,” or apoptosis), and replication ensures that new cells are made to take their place. When they are acting normally, cells “know” which other cells to join up with and stick to – and they also know when to stop replicating and die. Each type of cell has a particular role and set of knowledge or instructions in their DNA (genes). Our cells know how to make the right number of fingers on our hand for us (and they know that fingers should only grow on our hands). Each finger is covered with skin and each finger has a fingernail. 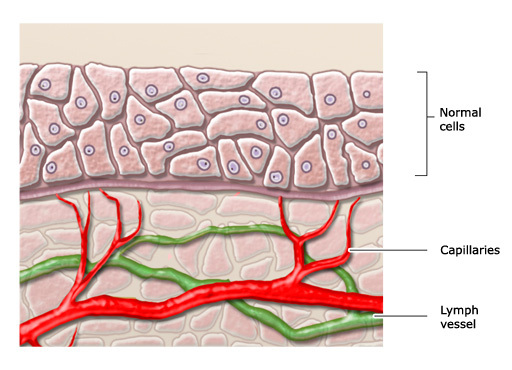 If we cut our finger, the skin cells will start replicating and create new skin to heal the wound. If we lose a fingernail, our cells can grow a new one. But the cells will not create extra fingers, even if we lose one. The rules are clear for those cells, and they keep to the rules. cause other tumors to develop. Malignant tumors can be life-threatening. But there are also some kinds of cancer that develop so slowly in older people that they do not lead to any problems in their lifetime. Benign tumors usually do not cause much damage and are not normally life-threatening. But there is no guarantee: benign growths can become dangerous if they grow a lot, or they might become malignant after a certain amount of time. If cancer cells start replicating, they do not behave like normal cells. For example, they do not know when to stop replicating and when to die. And they do not always stick together, so they might break away and move through the vascular or lymphatic system and start growing somewhere else in the body. 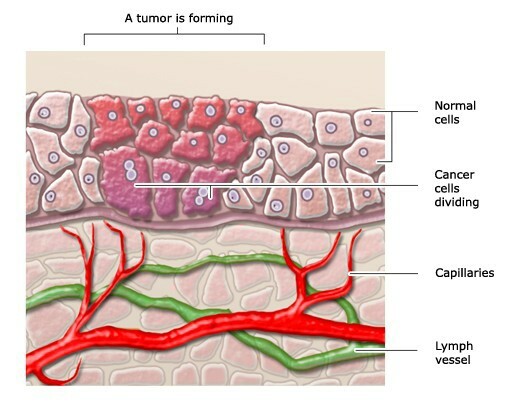 When a malignant tumor is contained within one area and has not spread to the surrounding tissue, like the one in the picture above, the medical term is “carcinoma in situ.” If this tumor does not keep growing, that means it is just lying there quietly (“dormant cancer cells”). It is not likely to cause harm unless it starts growing. 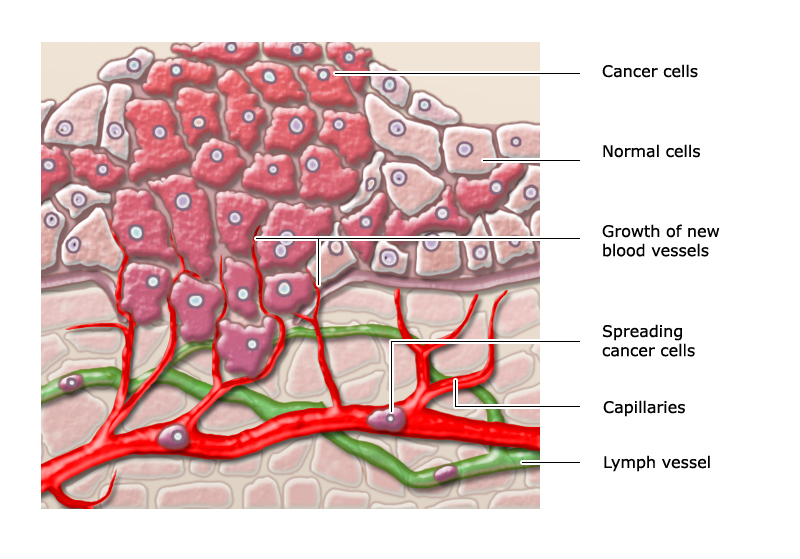 Active cancer cells can enter the bloodstream or lymphatic system and move to other parts of the body to start the process of forming a tumor all over again somewhere else (metastatic or secondary cancer). There are many different types of cancer treatments that all try to remove the malignant tumor, or at least limit the growth and spread of the cancer. Some cancers can be removed by surgery. Drugs (chemotherapy) or various types of radiotherapy are also sometimes used to shrink tumors before surgery. Chemotherapy and/or radiotherapy might be used after surgery too, to destroy leftover cancer cells and prevent the cancer from growing back (recurrence). If the tumor cannot be removed by surgery, medication and/or radiotherapy may be used. The exact treatment depends on various things, like the type of tumor and the stage of the disease. Cancer drugs work in different ways. Some aim to interfere with the cancer growth process by stopping the development of blood vessels that feed the tumor, for example. Other drugs specifically aim to stop the cancer cells replicating or reacting to hormones. Researchers are always trying to find new ways to limit the growth and spread of cancer cells.